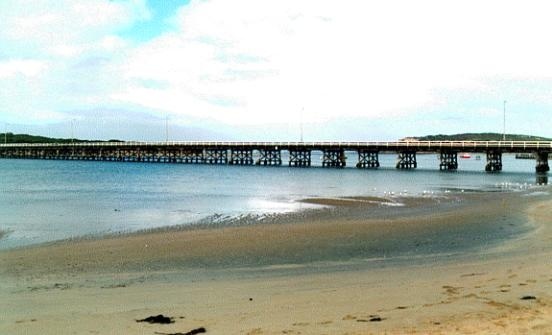 The Barwon Heads bridge is an exceptionally long timber beam road bridge of 34 spans built over the Barwon River estuary at Barwon Heads in 1927. Despite recent modifications such as the discreet addition of some steel beams and a 7.3 metre wide concrete and bitumen deck that better meets contemporary traffic needs, the bridge retains much of its historical integrity. The sympathetic modifications have preserved the essential form and aesthetics of a traditional timber bridge with its original driven-pile timber piers, twin pairs of cross-bracing, round timber corbels, old timber stringers, timber crossheads, timber abutments, and timber side railings. 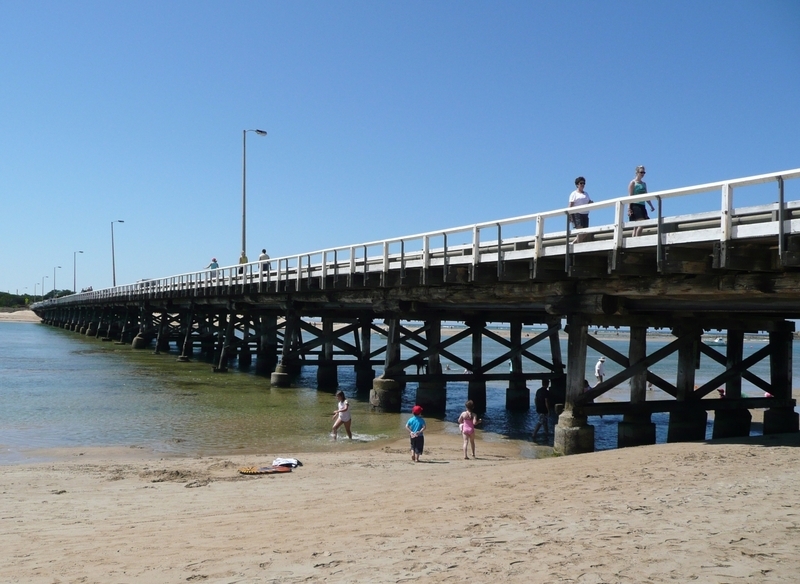 A major consideration in choosing the site for this bridge was its proposed tourist function and the desire to provide scenic views of the ocean and broad Barwon River estuary. Set amongst attractive sand dune vegetation at its eastern end, it provides an impressive and aesthetically-appealing profile when viewed from the river banks and is an historic gateway to the town. The bridge forms a link between major Victorian recreational and tourist districts. It is of historical, aesthetic, and scientific (technical) significance to the State of Victoria. It is of historical significance for its association with the Country Roads Board Tourist Road program, a State government-funded initiative that responded to increased motor car ownership and the growing popularity of motor touring during the 1920s. It was a major work in this program, which built some of Victoria's most famous coastal and alpine roads. The bridge was originally planned as a link in a proposed extension of the Great Ocean Road. It is the only surviving large timber bridge associated with the Tourist Road program. It is a rare surviving example of a historic timber bridge whose construction helped to shape a town's settlement. It is of aesthetic significance as a rare historic timber bridge in an estuarine setting. This particularly long, and low, timber bridge is a significant and sympathetic historical component of an outstanding natural and cultural landscape, and provides memorable marine views. The only other comparable historical timber bridge in an estuarine setting, the Hopkins River Bridge at Warrnambool, is scheduled for replacement. It is of scientific (technical) significance for its exceptional size, and as the best illustration of sympathetic modifications to a major timber bridge over time. At 308 metres, it is the second longest timber-piered bridge in Victoria and the longest bridge with timber stringers. The only other largely timber bridge of comparable length in Victoria, Kirwan's Bridge at Nagambie (310 metres), has had its original timber stringers replaced with steel beams throughout. 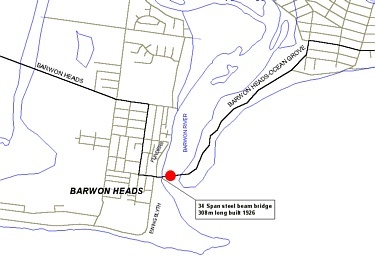 The durability of the original Barwon Heads Bridge owes much to research into Australian hardwoods at Sydney and Melbourne Universities during previous decades. The bridge exemplifies the whole evolution of timber bridge construction practice from the 1920s until modern times. No other timber river bridge designed in an era still dominated by horse-drawn vehicles has survived so many modifications to meet changing traffic needs, and yet retains so much of its structural integrity and historic appearance. It is a monument both to the 1920s, and to CRB engineering ingenuity over many decades. It is one of very few CRB timber bridges from the 1920s still in operation. The Barwon Heads Bridge has another special place in Victorian timber bridge history, because over many decades it provided Victoria’s central roads and bridges authority, the CRB, with an important model for, and much experimental knowledge relating to, the conversion of large old horse-era timber bridges to meet ever-changing traffic needs in this State. No other CRB timber bridge of the 1920s has survived so many adaptations to meet the long-term pressures for change on Victoria's roads. One of the main problems faced by Victorian bridge engineers of the late 1920s was accommodating the needs of both horse-drawn and motor transport, in a situation where nobody could reliably predict even short-term future traffic requirements. Although the CRB, from its origins, tended to favour concrete and steel for large bridge projects, its engineers were aware by the later 1920s that timber provided more flexibility, with easier and less-expensive modifications to meet changing conditions, than did the then-current concrete construction practices. In some situations where soil stability was uncertain or variable, relatively light timber construction made engineering sense quite apart from obvious advantages in initial cost outlay and consequent reduced interest repayments on construction loans. By 1927, the CRB was experiencing difficulty in obtaining sufficiently large and durable bridge timbers to meet its needs. Saltwater river estuaries provided a special problem, because the voracious Teredo worm could seriously weaken Victorian hardwood timbers in marine situations within a few years. Even the formidable ironbark timber, often used for piles in freshwater streams, was not proof against the salt-water predators. Hence more than 160 round pile timbers of Turpentine had to be imported from NSW, in an attempt to counter the Teredos’ appetites. 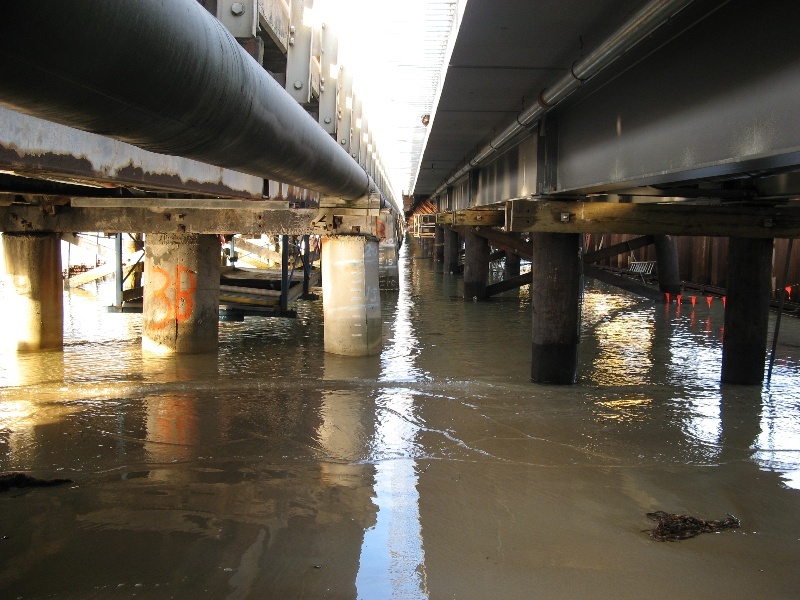 Ironbark was used above the water line for pier cross-braces and cross-heads, but the CRB account of the bridge's construction suggests that the original round-timber stringers were of Otway messmate rather than a more traditional superior bridge-timber such as ironbark. Although defective stringers and corbels were replaced during periodic redecking exercises from the early 1960s, some original timber stringers appear never to have been replaced (although their work is today relieved by steel joists inserted between the timber stringers). It is likely that the surviving original timbers are amongst the longest-serving messmate bridge stringers in the State. For detail on renovations and maintenance of the post-war years, I am indebted to information supplied by P. F. B. Alsop, a Geelong Divisional CRB Engineer in those years. They could not have withstood the pressures of the years had they not been protected by the provision of substantial timber 'spiking planks', particularly during the 1930s when the original transverse messmate decking suffered serious fungal attack following clumsy deck modifications to meet changing traffic conditions. The Great Depression of the early 1930s temporarily checked the inroads of motor vehicles upon Victorian roads, whose design until then had largely been dictated by the demands of slow moving horse drawn traffic utilising large diameter steel tired wooden wheels. However, the growth of tourist traffic (boosted by the fashionable new Barwon Heads Golf Club facilities) necessitated the addition of longitudinal running planks over the original transverse decking very early in the bridge's life. By 1933 the hazard and undue deck wear produced by passing motorists each reluctant to 'give way' by moving from central running planks onto the rattling transverse decking, led the CRB to extend the longitudinal running planks across the whole deck width. For good measure, and probably with ideas of keeping rainwater from permeating the timbers, a coating of 'impervious' bitumen seal was added. The lesson was quickly learned that a bitumen top-seal provides a wonderful cover for fungal attack on bridge-decking timbers, particularly in damp marine environments. Thus, major renovations were again required to the deck of the Barwon Heads Bridge in 1940. Doubtless, other CRB timber bridges enjoyed a protracted life due to this salutary lesson. In 1940 the old horse era transverse-deck design was converted to a 'modern' CRB motor bridge standard by removing the original deck and spiking planks and replacing them with timber cross-beams over the original stringers to support a single layer of longitudinal timber decking. This 'new' deck was constructed from still-usable remnants of the previous double-layer decking, now carefully ventilated and not threatened by continuous contact between dual decking surfaces as previously. The CRB also applied other lessons recently learned about bridge-timber preservation, to ensure that the reconstructed bridge represented the latest ideas in timber motor-bridge design. 'Bituminous felt' was used to separate timber stringers from the widely-spaced timber cross beams, and to prevent life-threatening contact between decking and cross beams. Holes were not bored through cross beams as formerly, steel fastenings being fitted along the sides of the cross beams to avoid bolt-hole-rot situations. This major reconstruction as a 'modern' CRB motor bridge was carried out over six months of the off-peak tourist season (Country Roads Board, 27th Annual Report, 1940, pp. 35-6. With recurrent maintenance and some widening to meet post-war traffic needs, this timber motor bridge proved adequate until the 1980s. By 1961 a modification of the original narrow deck was necessary, and as part of a significant renovation program the bridge was widened to provide over 18 feet (5.5 m) of carriageway, with a reconstructed footway of four feet eight inches (1.42 m) to one side. A further widening of the carriageway became necessary by the mid-1960s, necessitating the construction of a new cantilevered footway, and by 1975 a few stringers and piles needed replacement. However, in 1981 a more major reconstruction was essential to keep the ageing bridge in service. 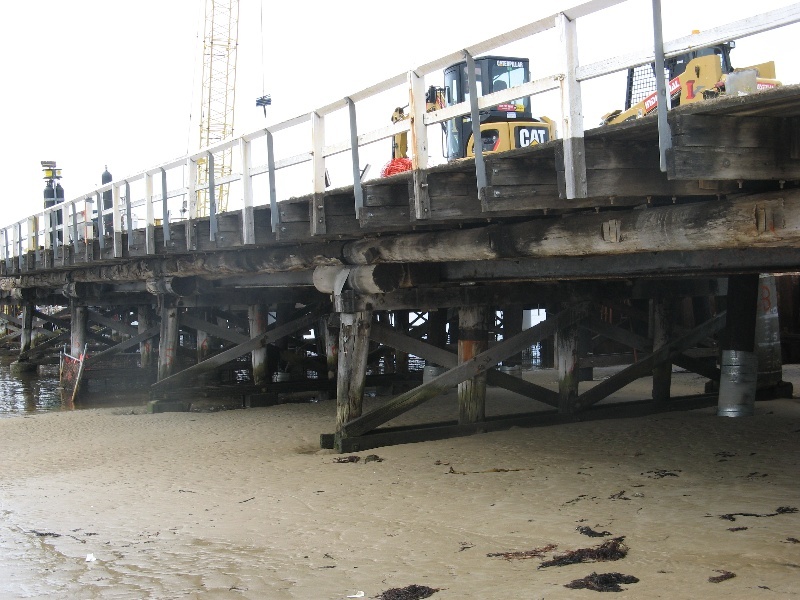 Although the NSW turpentine piles did a good job in resisting Teredo worm attack, concrete 'collars' encasing pile bases had become necessary to protect ageing pile timbers from serious weakening. 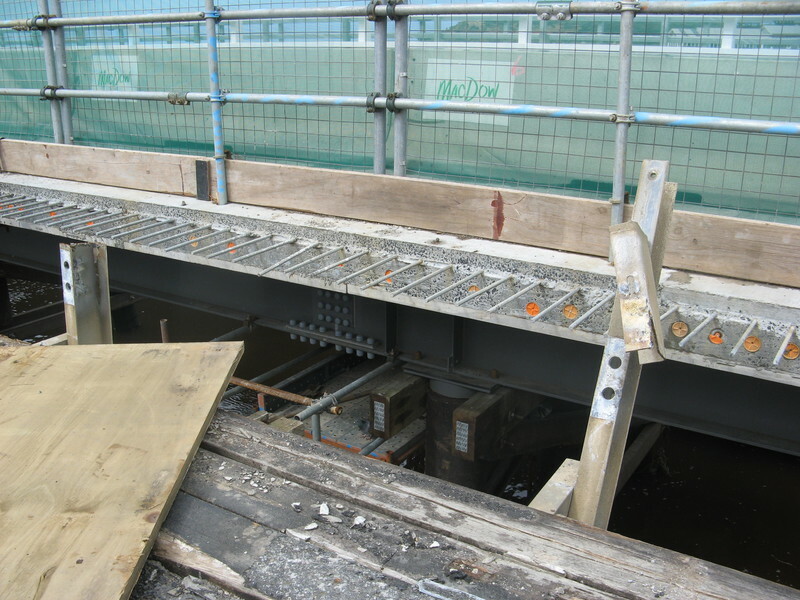 Ageing timber stringers, originally provided for sparse traffic, were reinforced by the addition of inter-spaced large steel joists almost out of sight below deck. A modern concrete deck incorporating concrete kerbing and bitumen seal was henceforth supported by timber piers, but the traditional timber railings were retained. A CRB photograph of the original horse-era bridge in 1927 shows the same pier pattern as exists now, except that the distinctive double pairs of cross-bracing were not then used on the two land-based approach span piers they are as today. 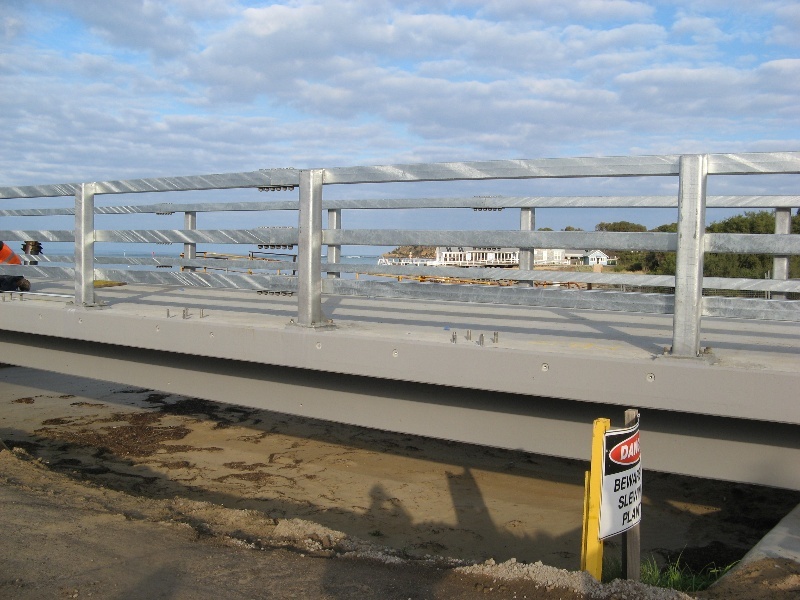 The existing Barwon Heads Bridge is a monument to CRB engineering ingenuity over a long period between the later horse and buggy era and the modern automobile age. From the beginning it has been recognised as a State rather than a municipal responsibility. 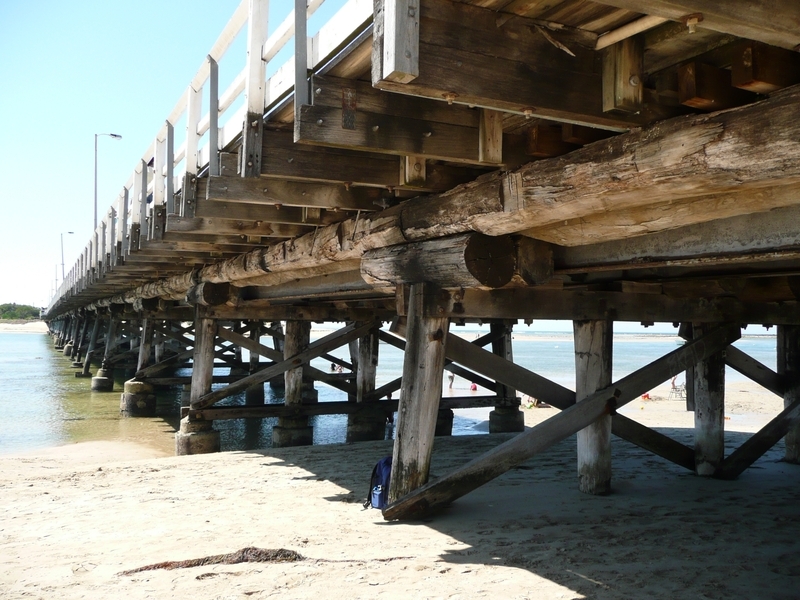 It stands out amongst Victoria's timber road bridges for its sheer length, its aesthetics and rare estuarine context, its long-term popularity with tourists and fishermen, and for its historic contribution to the growth of the important resort centres of Barwon Heads and Ocean Grove. The Barwon River Estuary early this century was a popular recreation area for Geelong and district residents. However, the modern town of Barwon Heads (including the provision of electric power) really dates from the mid 1920s when the fashionable new Barwon Heads Golf Club building first put the settlement firmly on the wider-Victorian social and sporting map. 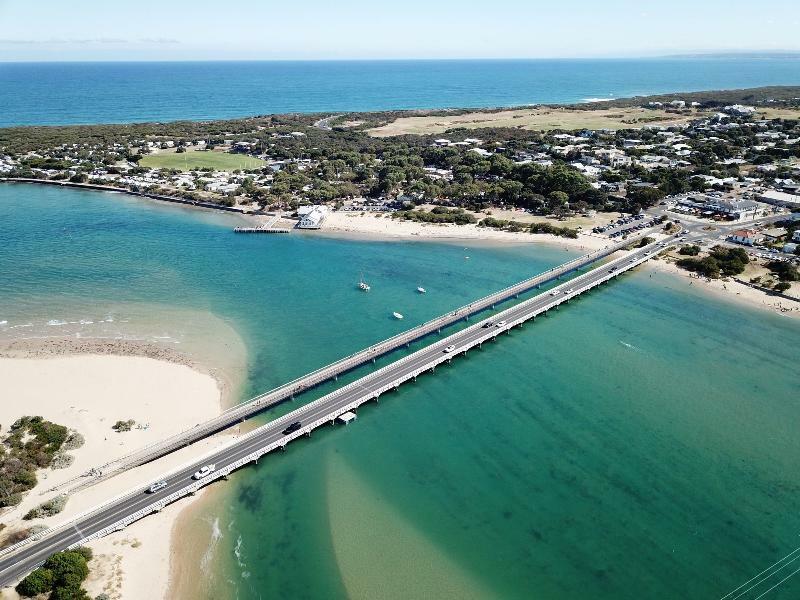 The Barwon Heads Bridge has contributed significantly to the town's growth and popularity, by providing easy access to and from adjacent resort areas and tourist attractions on the Bellarine Peninsula, Surf Coast and Otways. The Country Roads Board did not make tourist roads an official category of its works program until the “Tourist Road Act” of 1936. However the notion of tourist roads had been in common usage since at least 1922, when the Parliament allocated £50,000 for the construction of tourist roads. Some of the early tourist roads built by the Public Works Department, were the Acheron Way, and the Mt Donna Buang Road. Large river estuary bridges with timber piers and abutments, timber stringers and corbels, and traditional timber railings are extremely rare in Victoria today. Even rarer are large timber bridges that pre-date the CRB’s historic decision in 1931, to depart from traditional transverse-planked timber decks of the horse-era, and develop a new standard timber bridge type featuring longitudinal deck planking laid over spaced timber cross-beams, expressly intended for the demands of motor transport. Despite unavoidable but unobtrusive modern modifications in steel and concrete, this historic bridge retains much of its old 'timber bridge' charm, which is highly valued by both the local community and visitors. Its loss would be a major blow to our Victorian heritage. The historical importance, association with or relationship to Victoria's history of the place or object.The Barwon Heads Bridge is of historical importance for its association with the State Government's "Tourist Road" program, a response to the increase in motor car ownership and popularity of motor "touring" during the 1920s. It was a major work in this program, which was responsible for creating some famous roads to Victoria's seaside and alpine resorts, such as the Great Ocean Road, Mount Buffalo, and Mount Donna Buang Roads. The bridge was originally planned as a link in a proposed extension of the Great Ocean Road. As a result, the bridge was built under the supervision of the Country Roads Board rather than by the local municipality, though it was partly funded by Council contributions and local subscriptions. It is also important as a rare surviving example of a historic timber bridge whose construction helped to shape a town settlement. Most of these crossing place bridges have now been replaced by modern concrete and steel structures. The importance of a place or object in demonstrating rarity or uniqueness.The bridge is of exceptional length for a timber bridge. It is by far the longest surviving example of a "timber stringer" road bridge in Victoria and is believed to be the longest timber bridge ever built by the Country Roads Board. It is the only surviving large timber bridge associated with the Tourist Roads program, and without doubt the most significant example. It is a unique example of a bridge, built by the CRB in the period of transition from horse to motor vehicle traffic in the 1920s, which has been successfully modified to carry modern traffic while retaining its integrity as an essentially timber structure. It is one of very few CRB timber bridges from the 1920s which are still in operation. It is an extremely rare historic timber bridge in an estuarine setting. Together with the soon to be demolished Hopkins River Bridge at Warrnambool, it is the largest and most impressive historic timber bridge to survive in such a setting in Victoria. 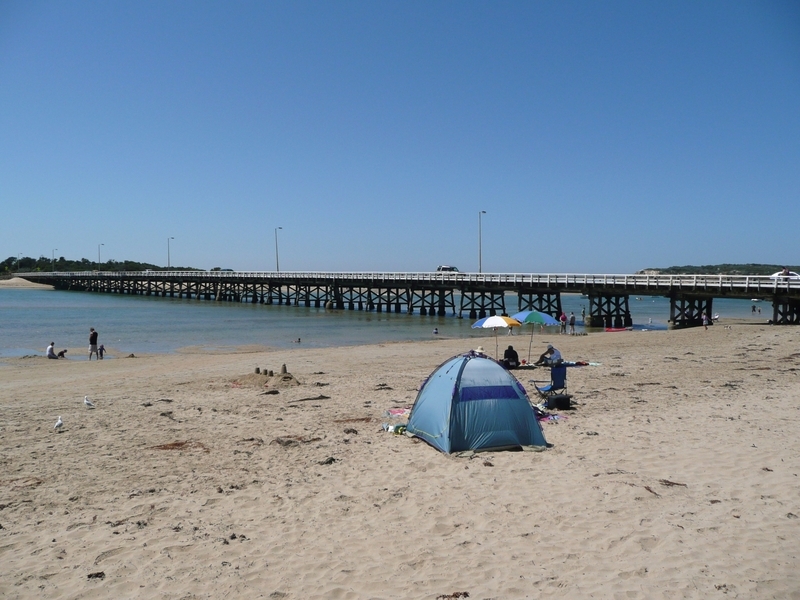 The Barwon Heads Bridge has the potential to educate about the historical developments of tourism in Victoria, and in the relationship between early (timber) bridges and the development of towns and settlement patterns. It has the potential to demonstrate developments in timber bridge design that resulted from research into Australian timbers in the late nineteenth and early twentieth centuries, and subsequent twentieth century developments in timber bridge design. It is a unique remaining example of a large timber bridge built by the CRB in an estuarine environment, using the latest research into the most appropriate (durable) species of Australian hardwood. It exhibits the successful modification of the bridge to modern traffic requirements while preserving its structural and aesthetic heritage significance. Its long and low form and vernacular timber construction make a significant and sympathetic contribution to a natural and cultural estuarine landscape of considerable beauty and uncommon type in Victoria. It also provides an excellent platform for memorable views of this outstanding estuarine and marine setting. 1. All exempted plans and alterations are to be carried out in a manner which prevents damage to the fabric of the registered place or object. 3. If there is a conservation policy or plan approved by the Executive Director, all works shall be in accordance with it. No permit is required for routine maintenance or minor repairs which replace like with like. It is the purpose of the permit exemptions to enable routine maintenance and repairs which do not damage the significant fabric of the place, or diminish its cultural significance.